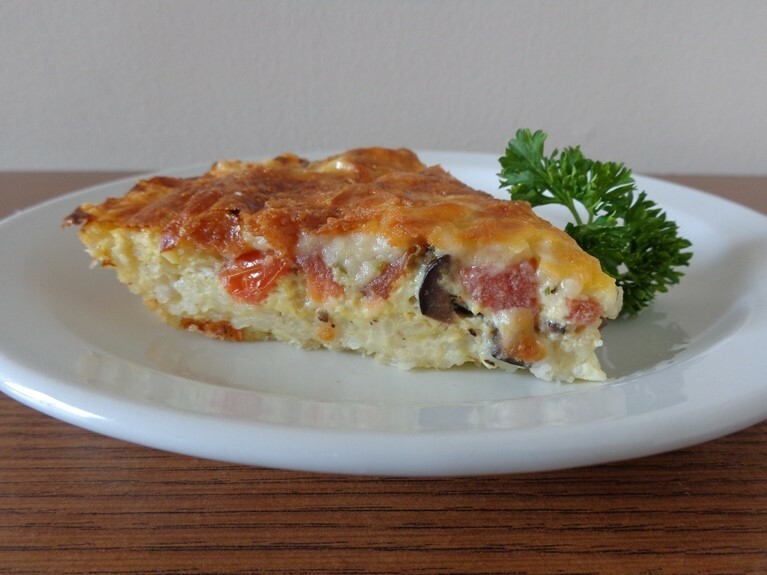 Check out this delicious Olive Tomato Rice Quiche recipe from VeeTee member Hidemi Walsh and the story behind it: I have made “Rice quiche” using cooked rice (not this brand) for the crust and my mother-in-law loved it. So this time I made a rice quiche with VeeTee long grain rice for her. I took her health conditions into consideration and made a healthy version for her. This is gluten free, low in calories and guilt free yet has lots of appetizing flavor. The best part is crispy rice crust! 1 small Tomato, about 0.25lb. 1. Preheat the oven to 400 degrees F. Grease a 9-inch pie plate with nonstick cooking spray. 2. Cook rice following by the package directions. Transfer the rice into a bowl. Add 1 egg and rice flour to the bowl. Mix to combine. Add salt and black pepper to taste and mix to combine. Put the mixture into the prepared pie plate. With wet hands, press firmly on the bottom and sides of the pie plate. Pork holes with a fork on bottom of the rice mixture. Put the pie plate into the oven and bake for 10 minutes or until the crust is set. 3. In the meantime, make filling. Chop tomato and olives. In another bowl, whisk 2 eggs and add milk, olives, tomatoes, oregano, basil and parsley. Add salt and black pepper to taste and whisk to combine. 4. After 10 minutes, remove the pie plate from the oven. Put the filling into the crust. 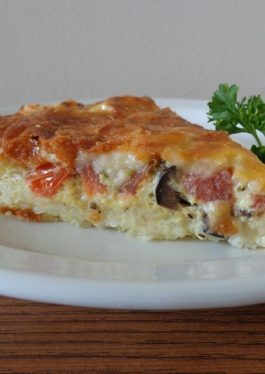 Sprinkle with cheese over the top and bake in the oven for 32-35 minutes or until the center of the quiche is set.